Warming seawaters, caused by climate change and extreme climatic events, threaten the stability of tropical coral reefs, with potentially devastating implications for many reef species and the human communities that reefs support. Similar magnitudes of coral death have been reported on many other reefs in the region, including on the northern Great Barrier Reef, suggesting similar impacts may be very widespread. 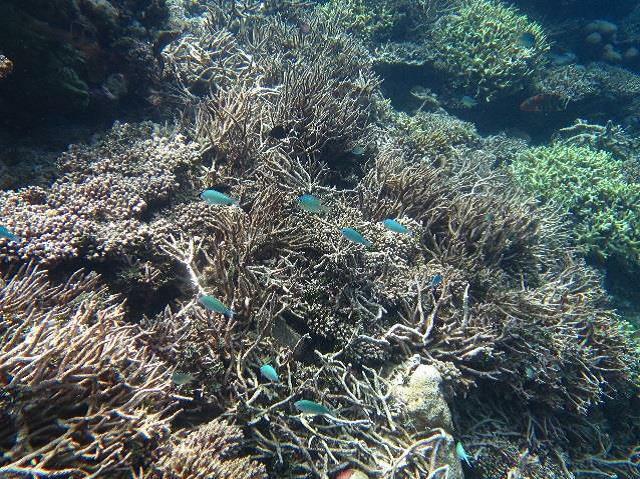 Picture was taken in September 2016 along the shallow (2-3 m depth) fore-reef slope habitat around Kandahalagala showing the extent of coral bleaching-driven coral mortality that has preferentially impacted Acropora sp. Professor Chris Perry and Dr Kyle Morgan, of the University of Exeter's Geography department, studied the impact of the 2016 El Niño event at sites in the southern Maldives and found that the event had not only caused widespread coral bleaching, a phenomenon whereby corals expel their photosynthesising algae when stressed by high temperatures, but that this had also led to extensive coral death in all shallow water reef habitats examined. 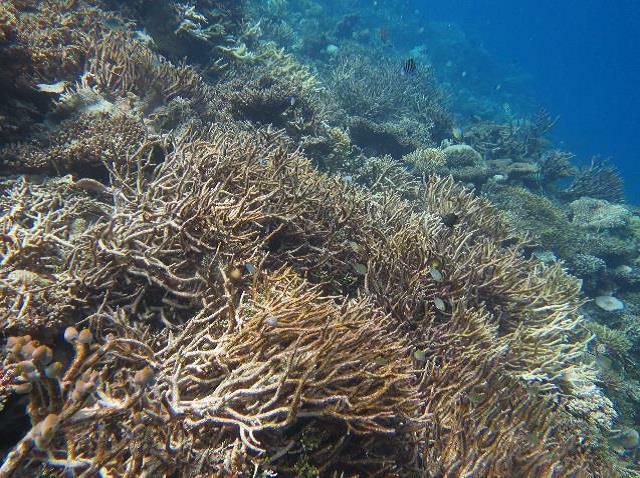 "A very major concern now is how quickly these reefs might recover. Recovery from similar past disturbances in the Maldives have taken 10-15 years, but major bleaching events are predicted to become far more frequent than this. If this is the case it could lead to long-term loss of reef growth and so limit the coastal protection and habitat services these reefs presently provide," Professor Perry said. "The most alarming aspect of this coral die-off event is that it has led to a rapid and very large decline in the growth rate of the reefs. This in turn has major implications not only for the capacity of these reefs to match any increases in sea-level, but is also likely to lead to a loss of the surface structure of the reefs that is so critical for supporting fish species diversity and abundance." Coral reefs are formed by the accumulation of coral skeletons (made of calcium carbonate) that builds up over 100's to 1000's of years, forming the complex structures that support a huge diversity of marine life. The so-called 'carbonate budget' of a reef, which represents the balance between the rate at which this carbonate is produced by corals and the rate at which it is removed (by biological or physical erosion or chemical dissolution), influences the development of these structures and how fast a reef can grow. The effect these combined factors was a major decline in the carbonate budgets of these reefs, with an average reduction of 157%. Before the warming event, the reefs had been in a period of rapid growth, but after the period of higher sea temperatures a negative carbonate budget was recorded at all sites. Put simply, the structure of these reefs is now eroding at a faster rate that it is growing. Based on past studies the researchers suggest that given the severity of the bleaching impacts it may take 10 to 15 years for full recovery to occur. The extent of the 2016 bleaching, which also affected reefs in other parts of the Indian Ocean and Pacific, was so severe that it was subsequently named the 'Third Global Coral Bleaching Event'. Dr Kyle Morgan said: "Coral reefs provide a wealth of benefits. They are vital habitats, essential for a vast number of species and they are also important for tourism and food provision. The reduction in carbonate budget threatens these benefits and may well also lead to the structural collapse of reefs. The key issue to consider now is whether, and when, these reefs will recover, both ecologically and in terms of their growth. Based on past trajectories, we predict recovery will take at least a decade, however it all depends on the extent of future warming events and climate change." University of Exeter scientists warned there could be further rises in sea temperatures owing to global warming with potentially devastating effects on coral reefs. "We expect El Niño variability to continue into the future which, when combined with rising temperatures due to global warming, means we will see unprecedented sea temperatures and increasing incidence of coral bleaching." Bleaching drives collapse in reef carbonate budgets and reef growth potential on southern Maldives reefs is published in Scientific Reports.